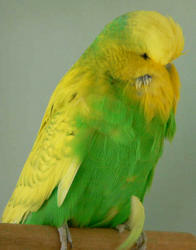 Their seems to be a fair amount of confusion within the fancy , regarding the breeding of quality Budgerigars. I think this has come about because there is so much contradictory information passed on to the fancy. Most of the techniques tried by fanciers do not give the results they were expecting. This is because the providers of the information are generally very experienced breeders, who are giving information about their own birds and experiences. This is fine, only they are in possession of better quality birds than most of us. I have no doubt their information is correct, but it is only relevant to their own birds and as such can't be considered a generalization. Therefore, what is successful for them would have a very different result if they were working with lesser quality or even a different line of birds. So what works for them will not necessarily work in our aviaries. Thus we need to formulate our own strategy with which we can work, to breed better quality from whatever birds are in our present possession. Another important thing we must do when seriously trying to improve our birds, is to be very sceptical regarding the information passed onto the fancy in the way of miracle pairings. I'm sure your aware of the ones I mean, like flecked headed birds carry the feather you want, or use large dirty opalines to improve spot, put spangle into everything they will only do good and increase fertility at the same time. Some fanciers in Australia have become so paranoid regarding the shape of the wings on a bird, they have become oblivious to the rest of the bird. Some of our most experienced judges are indicating a bird is not a bird unless it has head blow. Forget the rest of the bird, head blow is everything. There are literally hundreds of these fallacies. These are the myths to disregard, always look at the complete bird, don't get sucked into current fads. To be fair some of the above ideas may have worked but I would suggest in very isolated cases, and remember they are only opinions to explain some inherited phenomena. Some people who utter these ideas do so without ever proving whether they work or not for themselves. If a bird isn't quality itself or isn't from a quality family, then it will not help you, regardless of which magical feature it has or variety it belongs to. If you analyse all the famous fanciers, the ones who have changed the way we think about and look at Budgerigars. The Alf Ormerods (dec.), the Jo Mannes, the Harry Bryans (dec.), probably the South African, Dr. Robertson and indeed a few others, but a very select few. These are the breeders of, not the buyers of birds. The quality of the birds in their aviaries has not been reliant on the quality of bird they can purchase year in and year out, it's a result of their own ability. These 'breeders' all give the same underlying principle to the fancy when probed on how they breed such superior quality stock. Almost always they will say "you must know your birds". This is fundamental to breeding any form of livestock to excellence, not only Budgies. The only way to get to know your birds is to work with them. Or in technical terms, progeny test or test mate them. This gives an indication of the capabilities of any particular bird, with regards to passing on features to the next generation. Jim Moffat claims, the first five pairings each year are the easiest to decide on. Why? Because he re-pairs the most successful pairings from the previous season. This is true in my aviary. My birds give their best in the second and third year of breeding. I believe this is because they have shown individually, what they are capable of, and I pair them accordingly. By 'World standards', I have not produced any what you would consider to be 'Super birds', although my overall quality is not bad, and I have produced a couple of birds with 'Grunt'. From my breeding results over many years, I would suggest the only reasonably successful way towards consistently breeding better birds is through progeny testing. This is the strategy to use. Find out the capabilities of your birds by the babies they produce. Our objective must be to identify the birds within our aviaries which breed superior youngsters, and perpetuate them. After a few seasons if you are on the right track, you should find your better quality birds are producing your best young. Always try to work with the absolute cream of your birds. Rather than pairing up everything in the aviary and hoping you will fluke a good one. Although, this seems to be a current trend with many breeders adding more and more breeding cages. Some have had success with this technique, and they justify it with the old adages, "you only need to breed one good one", along with "breed a lot to get a few". You can not consider aperson who adopts this technique to be a breeder with any competence. Pure Chance breeding or the numbers game. I liken it to playing Roulette at a Casino. Always, work with the very best birds you have and give them every opportunity to prove to you what they are capable of. Take your time, the babies each year will be the sign posts indicating the way forward. If you are not producing anything worth while, and you decide new blood is the only option, please consider this. Neither pedigree, nor a birds visual quality is a guarantee it will pass on its good qualities (visual or latent) to its progeny. For this reason buying birds should always be regarded as a bit of a lottery. Having said that, both visual quality and pedigree are an advantage, when deciding on which birds to purchase. Personally, I lean towards blood line procurements, they tend to be a little more reliable and generally of far less cost. Therefore, I can afford more blood line relatives from the selected superior family, increasing my chances of success. Only buy out of a good family of birds, regardless of the visual quality offered. The better the blood line you purchase, the more likely you are to see quality in the youngsters. If you wish to purchase top visual quality, and hopefully save many years work, expect to pay handsomely for the privilege. Quality can only be maintained and improved with attention to detail, keen observation and sensible well thought through actions. To conclude you must select for a birds ability to put quality in the nest.